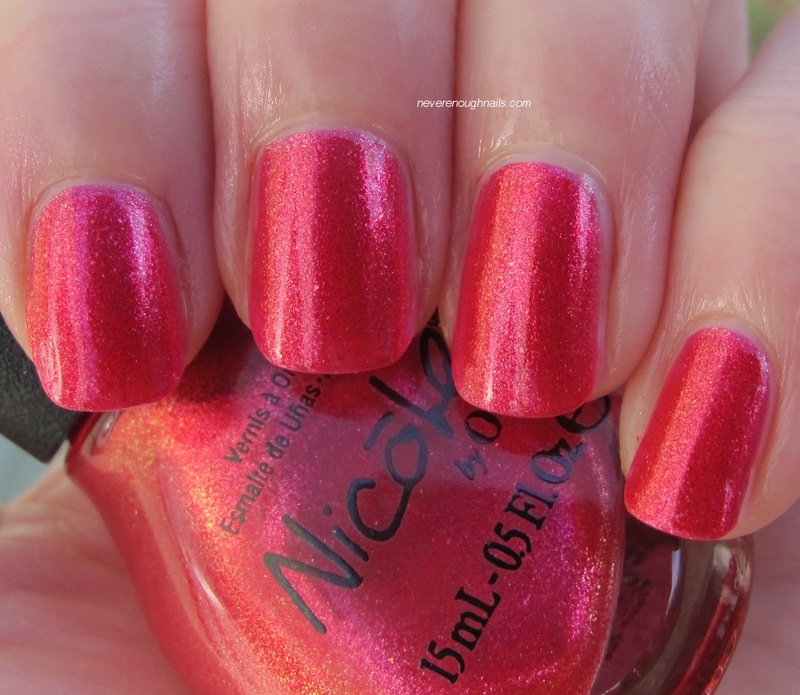 Thanks to a blast of winter sunshine, I have the rest of the Nicole by OPI Selena Gomez polishes for you today! I had a serious swatch-a-thon this morning. With snow coming tomorrow, I couldn't pass up this sun! These polishes made it pretty easy to pretend it was a warm spring day, especially Nicole by OPI Selena. 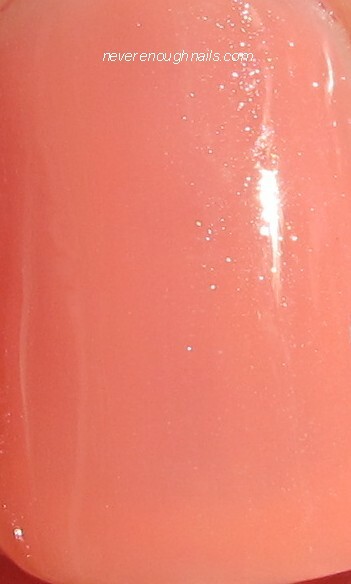 Selena is a pretty peach crelly (creme+jelly) with very delicate shimmer. I am not a huge pastel fan, but even I have to admit this is gorgeous. Something about the not quite creme, but not full on jelly finish is really lovely with this peach color. Also, the peach is less orange and more pink than some peach polishes I own. In the bottle, I thought this was a snooze, but once I put it on, I loved it! Selena applied pretty well for such a pale color. This is three coats, and there is a tiny bit of VNL. 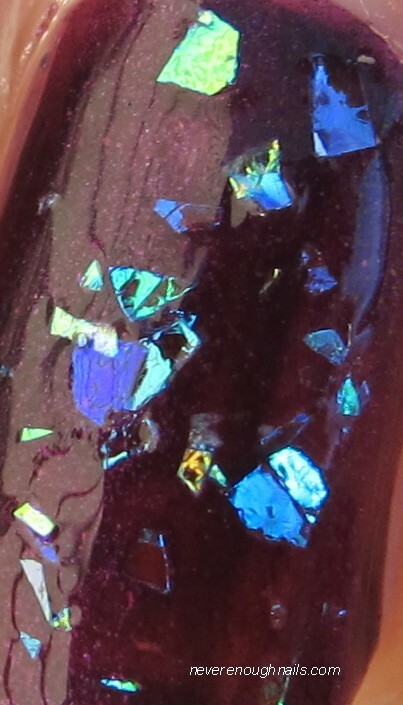 I think that is purposeful VNL though, with the jelly-ness of the polish, and I don't mind it. The first coat had a bit of streaking, but as you can see, that evened out completely with the second coat and there are no streaks in the finished look. 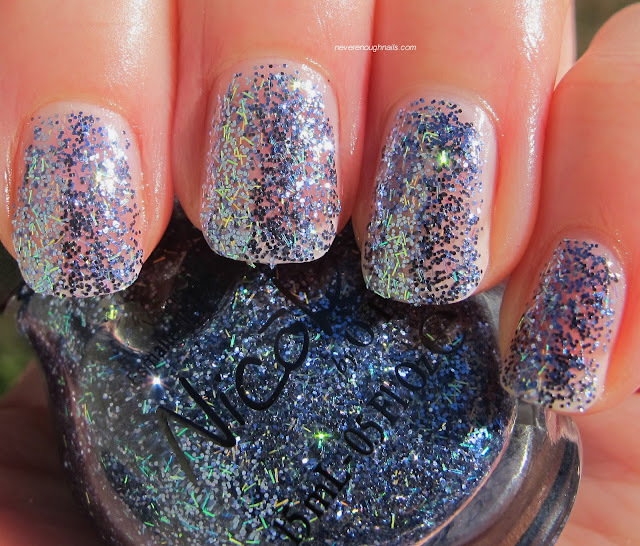 Nicole by OPI Inner Sparkle is another great glitter topper from this collection. Like the gold glitter Kissed At Midnight, Inner Sparkle has a couple different sizes of glitter in a clear base. This time, the larger glitter pieces are a lavender pink, and the tiny glitters look like they are a pale gold. 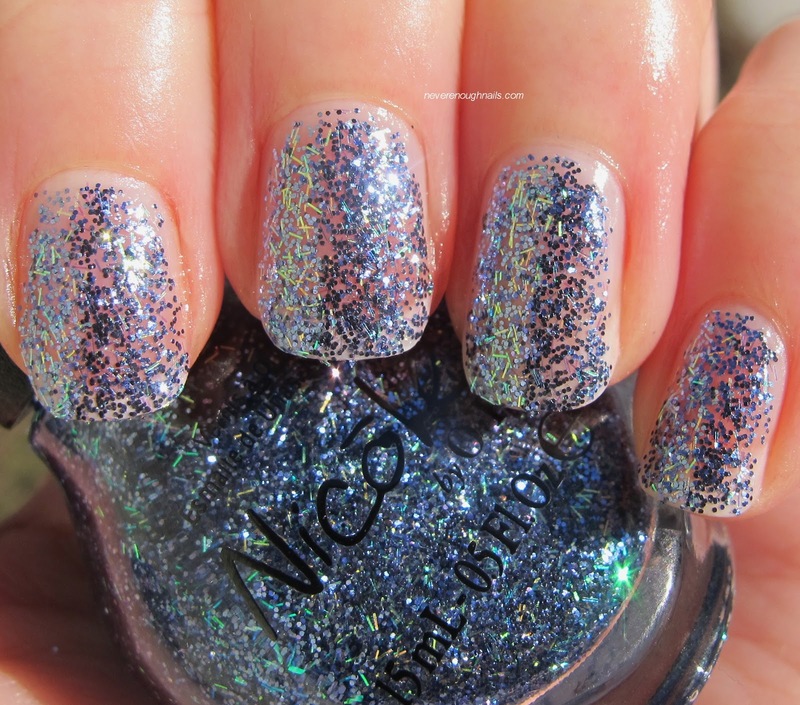 It's kind of an interesting "dainty" color for a glitter polish. I like it! I think I will try it over a lavender polish next, to really bring out those tones. Inner Sparkle was nice and easy to apply. This is two coats over Selena. I did not need to do any dabbing or special application methods. There were no problems with bare spots or needing to fish around for glitter. Overall, a very nice glitter topper! 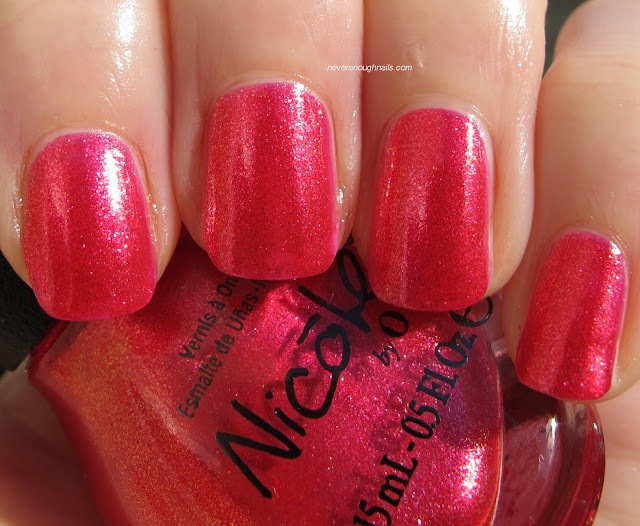 Nicole by OPI Scarlett is a pink-leaning red glass fleck-like shimmer. On me, this looks more like a fuchsia than a real red. Either way, it's bright and shimmery! Maybe not the most unique polish in the collection, but definitely a must have color for every polish lover. 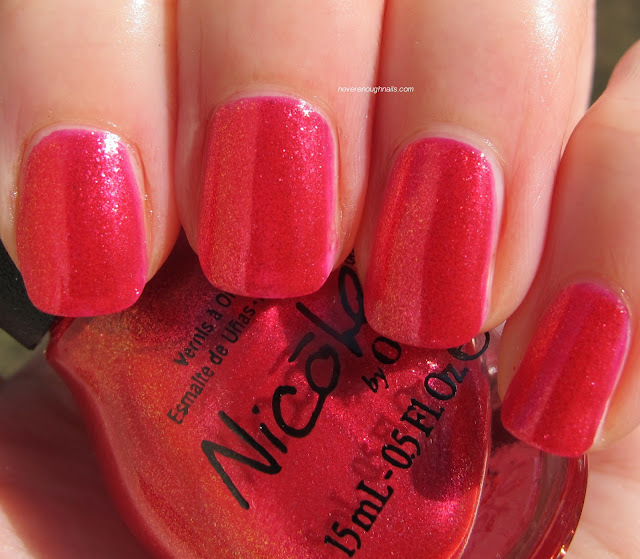 If you're in the market for a fuchsia red shimmer like this, Scarlett has a fantastic formula. You can't go wrong with this one. You can tell how excellent the formula is by how close I was able to get to my cuticles. These pictures were all taken with absolutely no clean-up. This is one of those formulas that feels a little gel-like, so it's so easy to work with. Scarlett has great pigmentation too, this is just two coats. Nicole by OPI Mi Fantasia is an interesting polish. 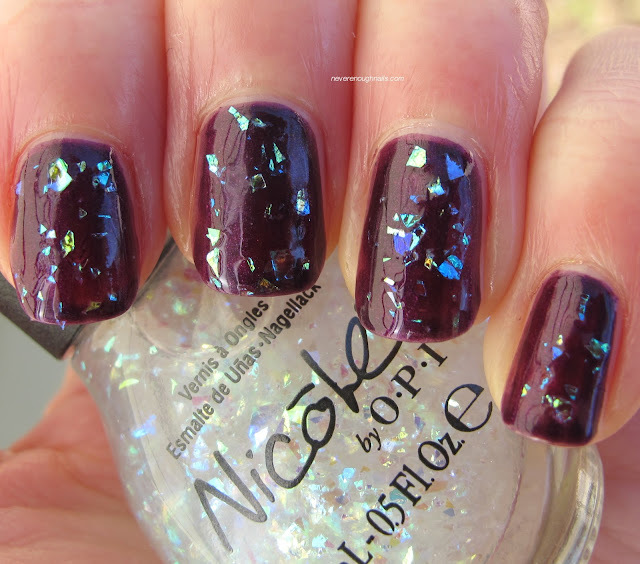 Mi Fantasia combines lots of medium blue-purple glitter and small holo bar glitter in a clear base. 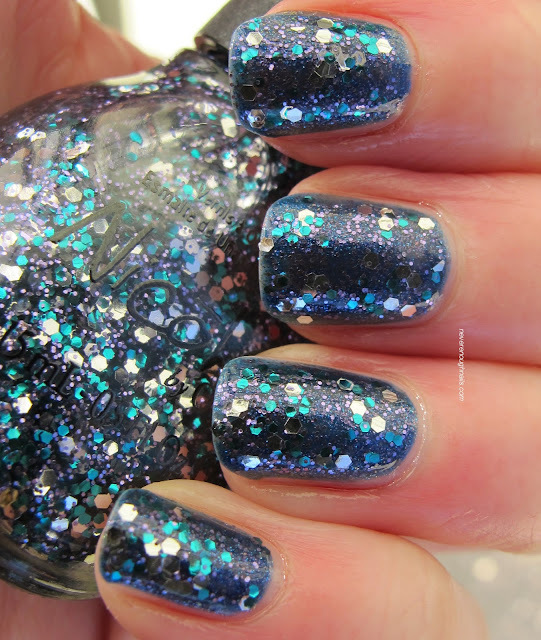 Being a bar glitter hater, I am never sure how I will feel about polishes containing bar glitter. I like this one though! I think it's because there is more purple glitter, and the bar glitter can't look hairy with all that non-bar glitter. It just adds a holo flash now and then. Just for kicks, I wanted to see if I could wear this alone, and it turns out, I can! 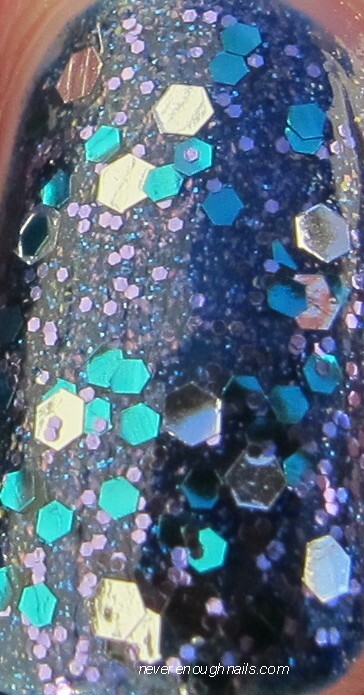 This is three coats of Mi Fantasia, and the coverage was a bit better looking in person. My camera always like to make glitter seem less dense. This was pretty easy to apply. The glitter is pretty packed in there, so it doesn't take long to build up the coverage. I think this would also look fantastic over black. Nicole by OPI Heavenly Angel contains irregular sized shards of iridescent glitter in a clear base. The glitter pieces are very iridescent and almost look like they are changing color every time you move your nails. 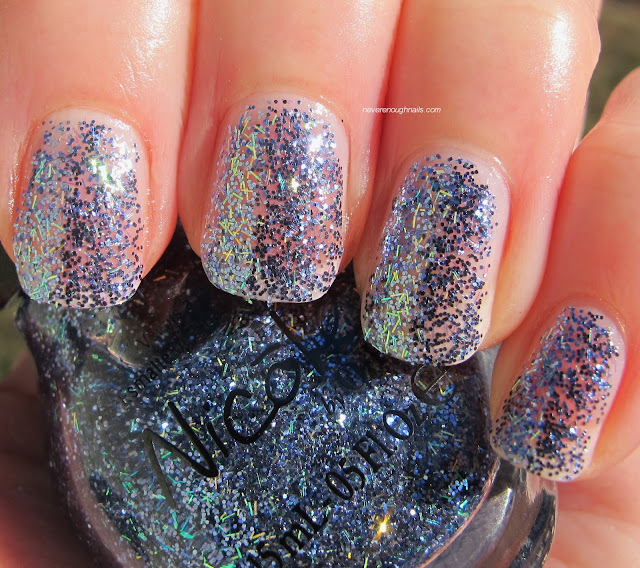 I have used other polishes similar to this, but I sometimes find the glitter doesn't look as rainbow-y on the nail as in the bottle. Heavenly Angel looks way MORE rainbow-y on the nail. Now for the down side, Heavenly Angel was not the easiest polish to apply. It definitely needed some dabbing and placement of the larger shards. It also seemed like the shards didn't want to come out to play, so I needed to do a bit of fishing to load up the brush. This is two dabbed/pushed coats of Heavenly Angel and in my opinion, the glitter could be more dense after two coats. If you're willing to put a little work in, the effect is gorgeous though! The glitter shards look like they're glowing! I love when Blogger thinks my pictures aren't fun enough and flips them sideways! Cool!!! (not). Anyway, I saved one of my favorite in the whole Nicole by OPI Selena Gomez collection for last! 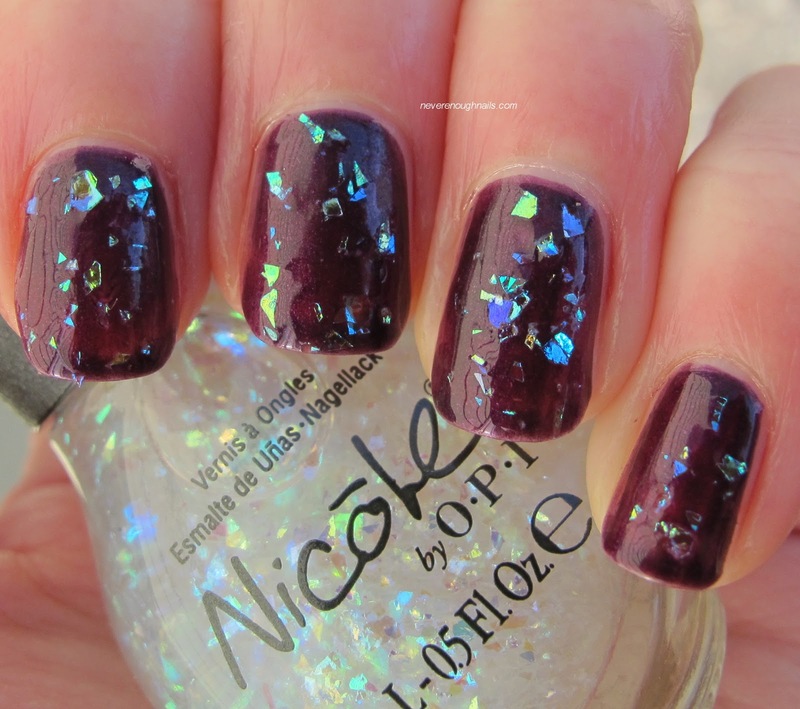 Nicole by OPI Sweet Dreams is a super cool and unique mix of teal, purple, and violet glitter in a clear base. The silver glitter is a largest, the teal is a medium size, and the violet glitter is small and really adds a lot to the mix. Look at the close-up below, doesn't this look like an indie glitter? Sweet Dreams had the same great formula as Kissed At Midnight and Inner Sparkle. Just apply like a normal polish and go! This is two coats. I think you could wear all three of these glitters by themselves in 3-4 coats, I just like layering them! This combination made me remember how much I like If the Blue Fits too! I may actually wear this combo for New Year's Eve! 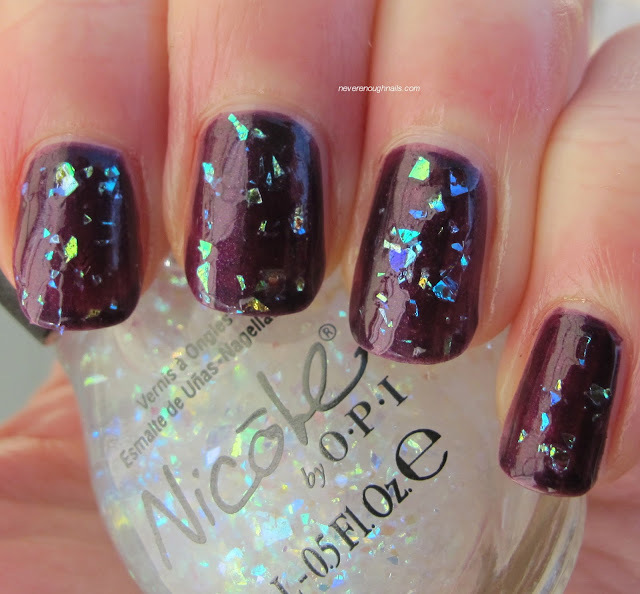 If you missed my two other posts about the Nicole by OPI Selena Gomez collection, you can check them out here and here. My favorites from the collection are Confetti Fun, Hit the Lights, Kissed At Midnight, and Sweet Dreams. Now that the spring collections are all coming out, it's interesting to see how Nicole by OPI decided to stray from the all pastel creme collections that other brands are doing, while still making this feel spring-y. Nicole by OPI Selena Gomez lacquers have already been spotted for $7.99 each at retailers including select Target, Walmart, CVS, K-mart, Rite Aid, ULTA, Sears, Meijer, Fred Meyer, Kroger and H-E-B locations. In Canada, this line will be available for $10.99 each at Shoppers Drug Mart, Walmart Canada, Jean Coutu, Loblaw, and London Drug.